Provide comfort for the family of Irene Olivier with a meaningful gesture of sympathy. Irene Mae Olivier, 79, of Corsica, SD passed away Thursday, January 3, 2019 at Douglas County Memorial Hospital in Armour, SD. Memorial Services are 10:30 A.M. Friday, January 11, 2019 at the Corsica Christian Reformed Church. A Committal Service will follow at Harrison Cemetery. Visitation will be held at the church one hour prior to services on Friday. 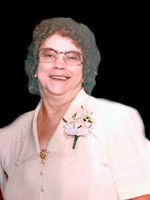 Irene Mae (DeJong) Olivier was born on September 12, 1939 to William and Fannie (Hobma) DeJong in Bon Homme County, SD. She attended country school and was united in marriage to Lloyd Olivier on April 10, 1959 at the Emmanuel Reformed Church in Springfield, SD. Irene enjoyed working with the elderly as a CNA at the Good Samaritan Society in Corsica. She was a member of the Corsica Christian Reformed Church and loved sewing, gardening and canning what she grew. Grateful for having shared in Irene’s life: her husband of over 59 years, Lloyd Olivier of Corsica, SD; seven children: Jerry (Krista) Olivier of Sioux Falls, SD, Todd Olivier of Sioux Falls, SD, Doug Olivier of Harrisburg, SD, Nyla (John) Lewis of Baker, FL, Trista (Tom) DeLange of Corsica, SD, Darcey (Dave) Hargens of Stickney, SD and Sasha (Damon) Shimp of Hills, MN; 16 grandchildren: Reagan, Ian, Jordan, Laramie, Walker, Calisa, Kieth, Aaron, Samantha, Zachary, Kruz, Candice, Kane, Austin, Aspen and Wyett; five great grandchildren: Payce and Kennedy, Kyla, Jackson and Avery; two brothers: Merrill (Bonnie) DeJong and Raymond DeJong; two sisters-in-law: Alberta DeJong and Marge DeJong; two brothers-in-law: Donald (Donna) Olivier and Dennis Olivier; along with many nieces and nephews. Irene was preceded in death by a son, Timothy Lloyd Olivier; her parents; five brothers; six sisters-in-law; and two brothers-in-law. 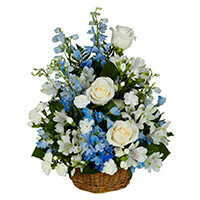 To send flowers in memory of Irene Mae Olivier (DeJong), please visit our Heartfelt Sympathies Store. Following lunch and fellowship with the family. My sincere condolences to your family. I know it's not easy to deal with at this moment. May God "who comforts us in all our trials" (2 Cor 1:4) comfort you and your family at such a difficult time. I know Jehovah God will help you to endure because He invites us to approach Him in prayer, to pour out our heart to him. (Psalm 62:8) Please find comfort in knowing that God understands your grief and He cares for you (1Peter 5 :7). Jerry and Family, on behalf of me, the Board of Directors and the Members and Staff of Minnehaha Country Club we give you our Sympathies, Thoughts, and Prayers to all of you! 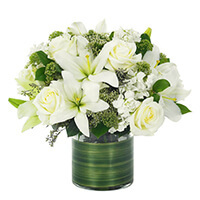 Ted Thie and Minnehaha Country Club purchased the Lovely Lily & Roses Bouquet-All White for the family of Irene Olivier. From our clan to yours - may this tree represent a new life in the memory of the one we loved and lost - A representation of God's beauty in all creations and the promise that there is something better waiting for us. May God give you peace knowing there is no more suffering or anguish. 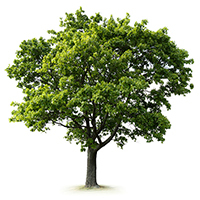 May this tree live long and healthy, giving life to others. Know there is life and representation in all trees, and now there will be one planted for your love lost. Someday - Go out and hug a tree. Please know our thoughts and prayers are with you now and always. I love you family and think of you fondly. Love you all bunches. May God give you peace and solace. Terra and Curt purchased the PEACEFUL WISHES BASKET for the family of Irene Olivier. Uncle Lloyd, I am so sorry for your loss. To my cousins, please remember your Mom with fondness and share your memories with your Dad. You will need one another through this difficult time and remember, love is strength.